With the ultralight Folding Titanium Spork from Triple Aught Design ($40), you can carry high-quality munching equipment without the added weight. Thanks to its titanium alloy construction, this spork is ultra-light, built tough and is less prone to bending. 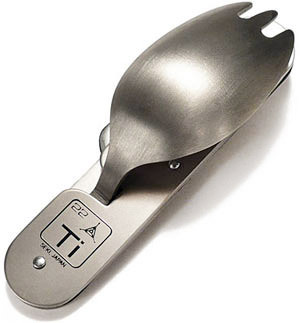 As an added bonus, the Titanium Folding Spork comes equipped with a built-in bottle and can opener.